Microartifacts are the small materials that fall through a standard ¼” screen. Generally archaeologists who study microartifacts look at the range from 1 to 4 mm, though some brave folks go down to as small as half a millimeter! Artifacts this small are difficult to see and require magnification, making their study somewhat tedious. As a result, they typically receive little attention. Since they are assumed to duplicate the same information we get from macroartifacts, only a handful of American archaeologists routinely study them. However, studies over the last two decades convincingly demonstrate that microartifacts are not simply smaller versions of larger artifacts. Rather they provide different kinds of information which supplement macroartifact studies. For example, at the Mississippian period site of Wickliffe Mounds in western Kentucky, my colleagues and I found tiny copper fragments inside a house structure. Only two slivers were found during 10 years of fieldwork, but when we looked at the microartifact assemblage (derived from the heavy fraction of flotation samples), we found hundreds of pieces—most of them just 1mm small! Even more interesting, chemical analysis of those fragments showed that it wasn’t elemental copper that Mississippian people used to make items of personal adornment (such as ear spools), but a fragile copper oxide, the kind that can be ground into a pigment for paint. Europeans who encountered historic period Native Americans recorded brightly painted houses, so this finding really shouldn’t be all that surprising. And yet if we hadn’t looked, we would not have found evidence for it. Since then we have found micro-sized pieces of other mineral pigments, including galena (black), hematite (red), and kaolinite (white)—all colors that had symbolic significance for Native Americans. 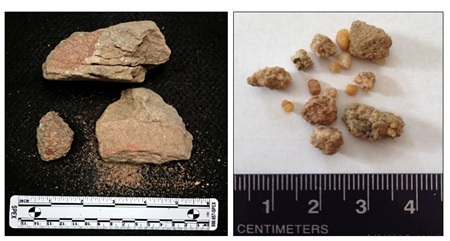 Left: microartifacts from Wickliffe Mounds (the copper is center, bottom row). Right: artist’s reconstruction of a painted Mississippian house. Several IUP students in the Department of Anthropology have incorporated microartifacts in their research. Junior Harley Burgis is looking at microartifacts from the Paleoindian through Archaic site of Dust Cave (in northwestern Alabama) as part of her Honor’s thesis. Harley is comparing microartifacts from different kinds of features, such as hearths, possible storage pits, and middens. The hearths are of particular interest because they come in many shapes and sizes. So far, she has found that the smaller hearths are more likely to contain burned shell and fish bone, while larger hearths seem to have a wider variety of materials, including bird and mammal bones, nutshell, and lithic debitage. Also, the bone is the bigger hearths is calcined, suggesting that those fires burned at a higher temperature than the small hearths. So it seems that at Dust Cave some hearths were reserved for steaming mussels and/or fish at low temperature, and others were multipurpose fires for broiling many kinds of foods at high temperature. Graduate student Kevin Gubbles (May ‘16) looked at microartifacts as part of his Master’s thesis on fire-cracked rock (FCR) at the Johnston Site, a Monongahela village in western PA. Kevin conducted a neat experiment to figure out how hot and how often rocks need to be heated to create FCR. One of his findings is that repeated heating of sandstone not only cracks the rocks and colors them red, but it also causes micro-sized grains of quartz sand to sluff off, what we call “attrition.” This is especially true for rocks that have been boiled in hot water. And the higher the temperature, the more attrition is produced. Looking through the microartifact assemblage at the Johnston site, there are copious quantities of these single grains that match the physical appearance of the experimentally produced ones, particularly in hearth features. The huge quantities of attrition discovered by Kevin suggest that stone-boiling technologies continued even well after the adoption of ceramics. On left, experimental FCR with micro-sized grains of attrition. At right, archaeological microartifacts from a Johnston Site hearth. Senior Paige Reimers is also looking at the microartifacts from the Johnston Site as part of her Honor’s thesis. She is comparing the microartifact content of different features to better understand how these they may have functioned. She is particularly interested in comparing the post mold features from the stockade and private domestic structures to post molds found in the central public plaza—a place generally kept free of structures and debris. The presence of posts here is surprising and we hope that microartifacts may shed light on what they were used for. Her analysis has just begun, but so far she has found a lot of the “attrition” mentioned above, supporting Kevin’s results that stone cooking, including stone boiling, was commonly employed at the Johnston Site, creating a long of refuse in the process. This entry was posted in Grad School, Labwork, Training, Undergraduate. hallo website, thank you for this great information, I hope this web can develop and become a webiste that provides a positive thing.